But Robert Fripp always knew what he was doing. And in the end, he created with the new King Crimson a curious piece of plastic where everything seems violent and undisciplined, but it isn't. Nothing is the way it seems, just like the cover, an intrincate pattern of lines and knots. The melodies try to escape from the tempos, just to come back to them again and go away. the music creates circles inside the circles, as a continuum into the psyche of the listener. Bruford plays at his limit, trying to keep the beats as much as coherently possible, while Levin, Belew and Fripp go outside that tempo, in different progressions. Trying to explain how is easy: following patterns of musicianship already developed year after year, when and where is easy: England, 1981. Why is impossible to tell. Robert Fripp and his henchmen were always a mistery for me. First, there's "Elephant Talk", again, Adrian Belew trying to turn King Crimson into Talking Heads. We love Belew more than David Byrne, so be it. Fripp helped Byrne with the Head's Fear Of Music album in 1979. You skip into "Frame By Frame" and the scatter of the guitar surrounding the stick bass lines makes you enter into an old movie theater. "Matte Kudasai" explores South Pacific melodic lines, tending to go into Japan. For "Undiscipline", the music is more complicated, repetitive and scary, therefore is fun to listen to. "I repeat myself when I'm distress" is the pattern. Belew could be the Louis Armstrong of the Progressive Rock. At least, the singin' one. There are a lot of instrumentalists. You confirm that with "Thela Gun Jeet Heet", the dance number of the album. How can you dance to this? Following the guitar or the drums? They're going in different directions! I don't know, ask Belew. Fripp won't answer. But Fripp doesn't let Belew sing a single line in the top song of this album, "The Sheltering Sky". The guitar arpeggios are superb, always in minor keys and going with numbers 7, 9, 13 and augmented. Circling the bass lines that seem to be, once again, the cornerstones of the tracks. Levin gives too much power in this album, that's for sure. In theory, this is not as good as In the Court of the Crimson King or Islands, but represents a big cornerstone in the evolution of a faction called "Progressive Rock" and represents the link between this genre and the "Alternative" sound that bands like Primus and Phish used to play in the early nineties. Discipline will be around forever, making circles, making us going for something better. Not an end, but a meaning towards and end. Muy buen disco de regreso de King Crimson luego de haber grabado su último album en 1974 Red. King Crimson ha tenido muchos cambios de personal este disco de 1981 Discipline fue el de regreso. 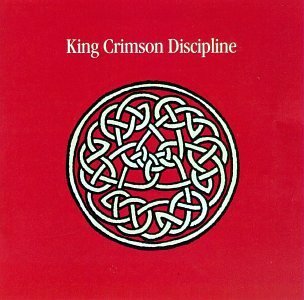 Fripp se dio cuenta que el sonido de King Crimson se encontraba ahí y reconsideró su decisión de llamar al grupo Discipline. Los otros miembros estuvieron de acuerdo con Fripp y en su lugar llamaron al álbum Discipline, bajo el nombre de King Crimson. La banda del Rey Carmesí había resurgido. Las mejores canciones son: Thela Hun Ginjeet, Elephant Talk y Frame by Frame. Pero hay una canción que me parece alucinante que se llama Indiscipline. Buen regreso del Rey Carmesi a principios de los 80s. El inicio de una trilogia de discos (Discipline, Beat y Three of a perfect pair) para luego Fripp desintegrar la banda que reapareceria nuevamente en los 90s. Conversamos alguna vez con Rulli Rendo! Qué tal?